"Thank you Arthur for bringing out the best in people; true rhythms, alchemy, fun, games, your playfulness, spirit, and wisdom. My biggest learning: I got the music in me, and I can share it. I do not have to be an expert." "The group was so full of positive energy…When I trust the group's energy and groove, then I'm able to naturally step out of the way. When the ryhthm is in the heart rather than the brain, my decision to get out of the way is an intuitive move." Village Music Circles™ Playshops, Trainings and events are happening around the world. VMC holds trainings in Malaysia, Singapore, Taiwan, Korea, Hong Kong, China, Japan, Australia, Spain, Italy, Norway, Germany, Iceland, England, Scotland, Ireland, India, United Arab Emirates, and USA. 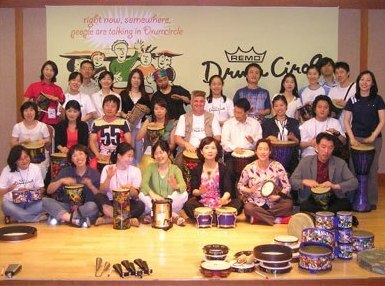 During the past 20 years Village Music Circles has trained over 10,000 Facilitators from more than 22 countries worldwide. VMC Trainings & Playshops bring together community leaders and facilitators for inspirational rhythm fun and learning. School Teachers, Music Therapists, Music Educators, Trainers and Recreational Leaders are among the thousands of Village Music Circles trained facilitators building community through rhythm worldwide. Where can I find International Playshops?